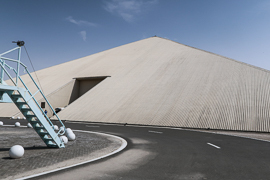 The area feels like nomansland in the desert – but when you take a 30 minute Southbound drive from Abu Dhabi, there is suddenly a giant metal pyramid to your left. 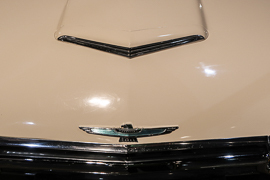 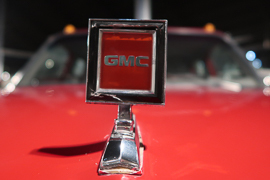 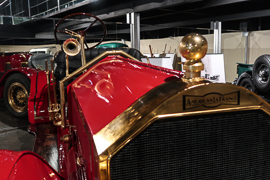 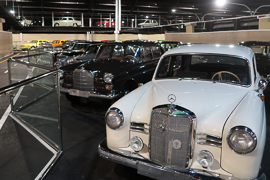 Make sure to take a stop here – you have reached the Emirates National Auto Museum (ENAM). 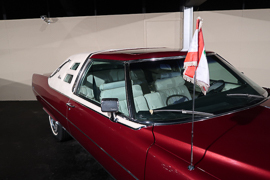 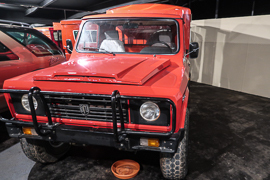 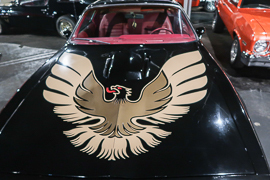 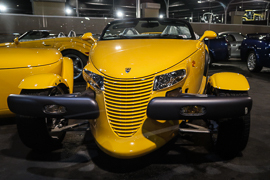 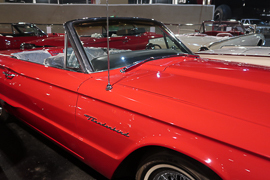 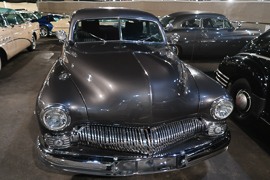 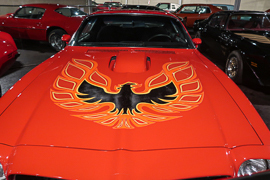 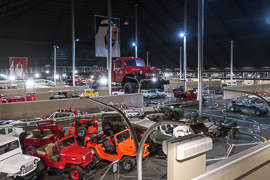 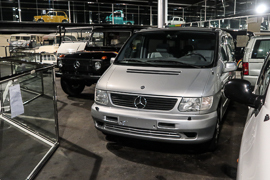 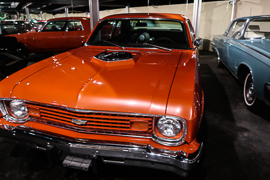 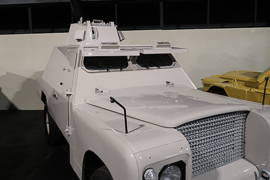 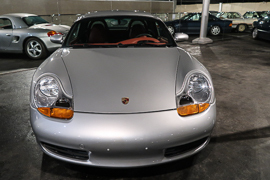 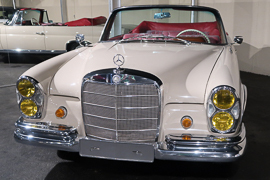 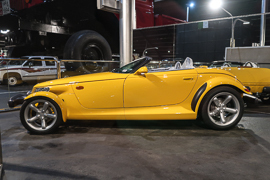 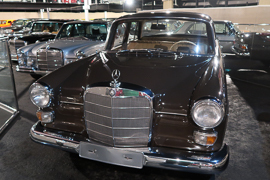 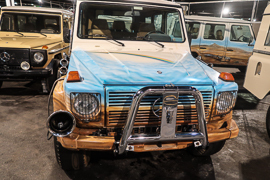 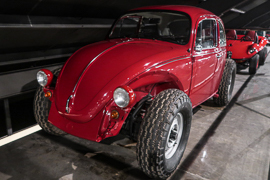 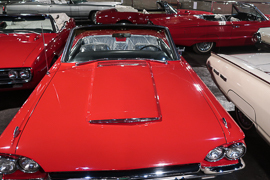 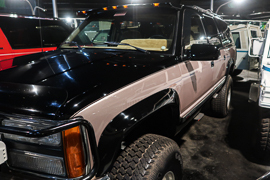 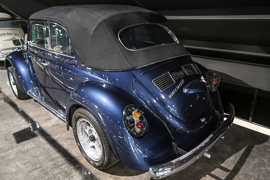 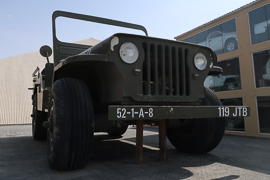 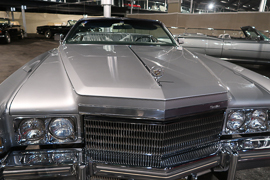 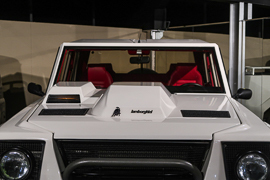 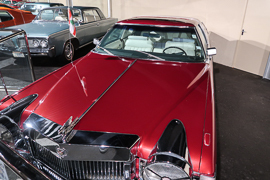 The museum is home of more than 200 cars, all collected and owned by Sheikh Hamad Bin Hamdan Al Nahyan. 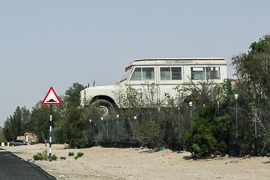 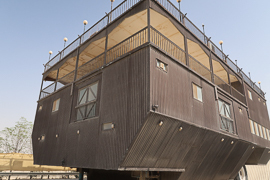 There are some houses for expat workers not too far away, but the Emirates National Auto Museum is really deep in the desert already. 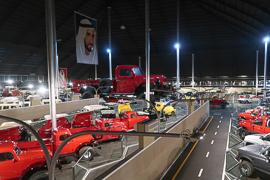 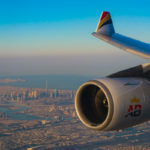 It is quite convenient to reach and some of the roads from Abu Dhabi there have the amazing speed limit of 160kph – so even the drive there is some nice opportunity for car enthusiasts. 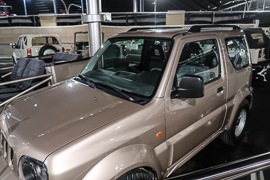 You pay the 55 AED admission at the security gate before the parking lot of the museum. 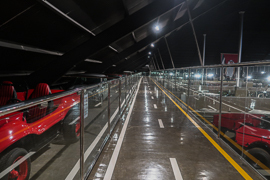 Gates are open between 9:00 and 18:00hrs. 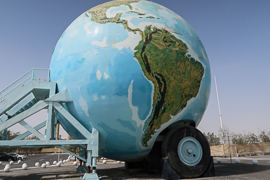 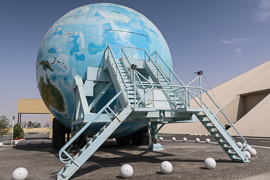 Just because it is right adjacent to the parking lot, the first outdoor exhibit you will likely approach is the huge globe trailer. 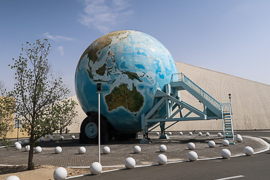 It is an exact model of the Earth with a 1:1,000,000 scale. 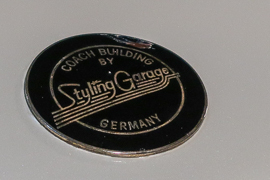 Unfortunately, you cannot have a look inside. 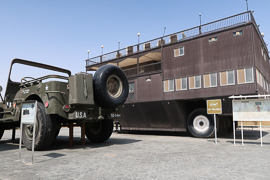 The most impressing exhibit is definitely the world largest two-wheel caravan trailer. 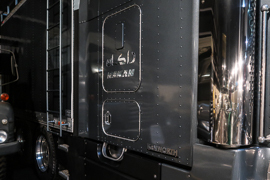 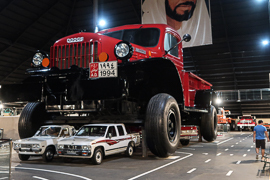 The dimensions of the massive trailer, which comes with a corresponding jeep as a towing vehicle is really hard to catch in a picture – the height is far more then ten metres. 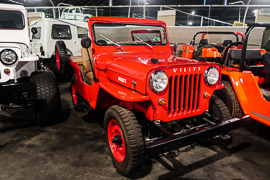 The towing vehicle is a for-times the original size Willey’s Jeep. 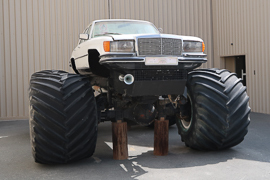 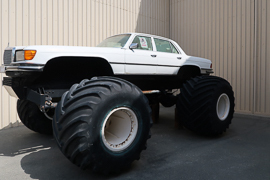 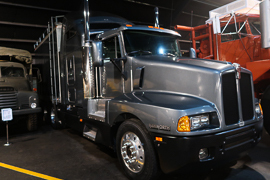 The Mercedes monster truck feels to be tiny compared to these giants. 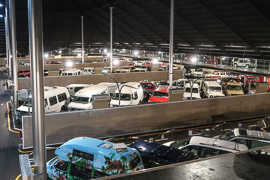 I personally did not feel the real size of the huge pyramid from outside – the more I was impressed when I entered the mega-size garage. 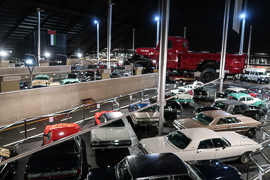 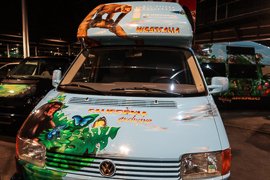 It is packed with cars, but there is plenty of opportunity to explore the exhibits. 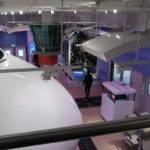 There are two key factors for that: Compared to other technical museums, it is not too crowded in there. 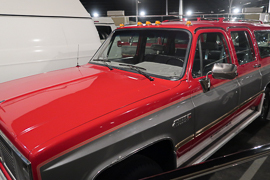 Secondly, there are mirrors behind a lot of the exhibits (you may explore that in some pictures), so that you can also watch the “hidden” parts. 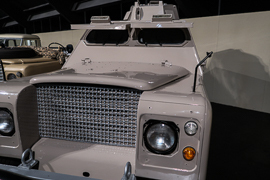 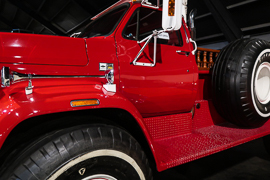 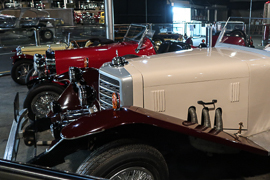 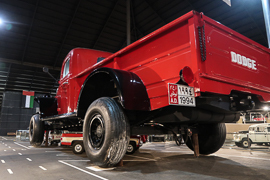 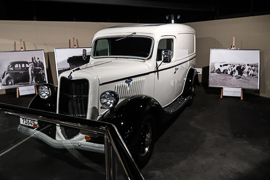 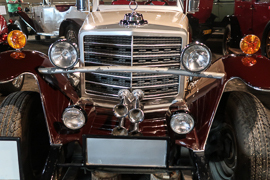 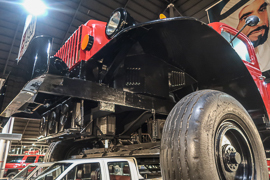 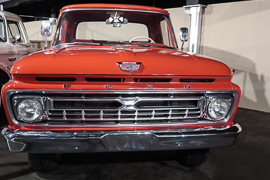 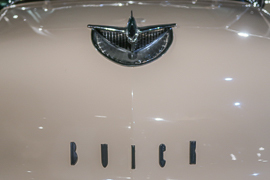 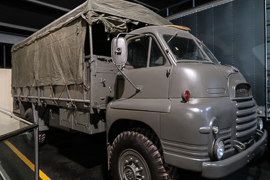 Apart from the huge portraits at the back of the pyramid, the eight times oversized version of the Dodge Power Wagon truck is the eyecatcher of the museum. 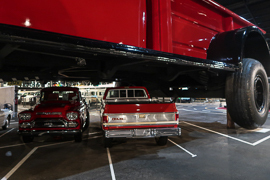 It is that massive that some cars are even parked underneath. 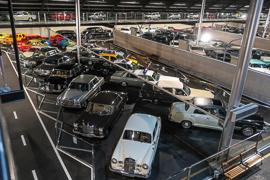 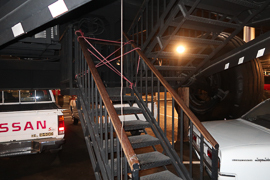 Interesting that there is a staircase accessing the car from the bottom – unfortunately it is closed for public. 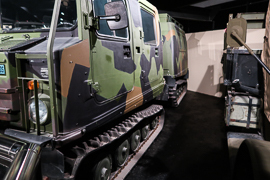 The exhibition is split into different sections. 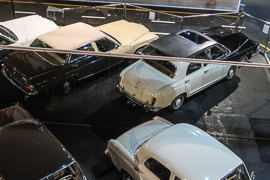 The first aisles of cars are a bit more mixed and include some very old cars. 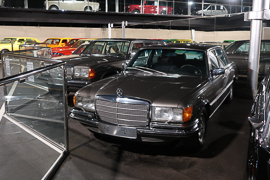 After that, there are separate sections for different kinds of cards like sedans. 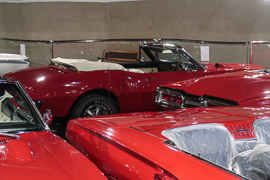 The variety of cars is very impressive. 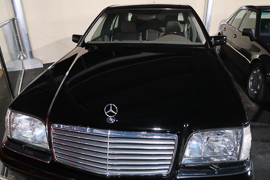 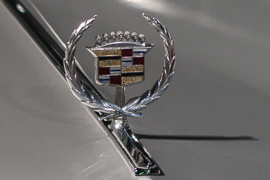 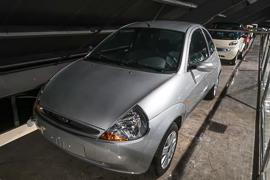 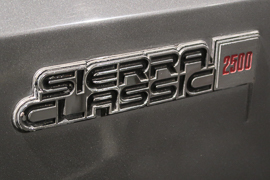 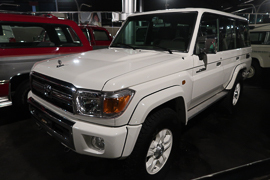 However, there are not just luxury models, but very ordinary cars. 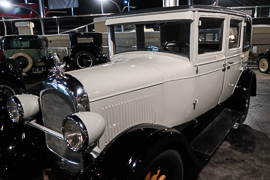 In the “ordinary” car section, you even find US sheriff cars and a New York Taxi. 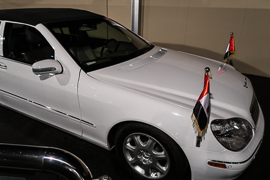 Sheikh Hamad Bin Hamdan Al Nahyan simply seem to love Mercedes – thus, there is a separate section just for this brand (though there are other models spread over the whole exhibition). 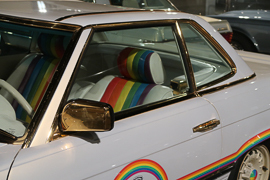 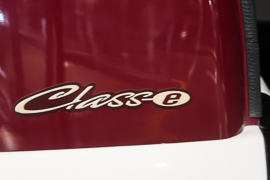 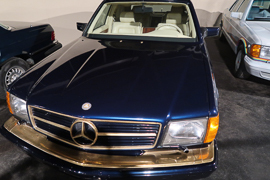 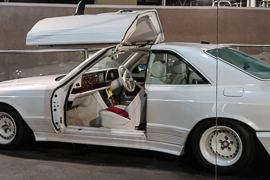 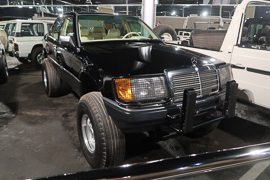 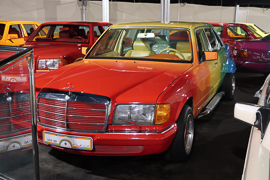 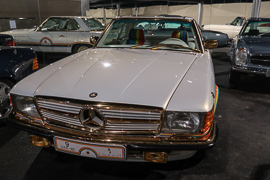 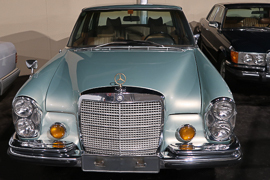 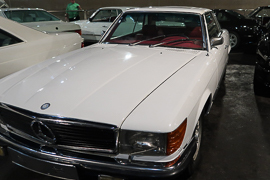 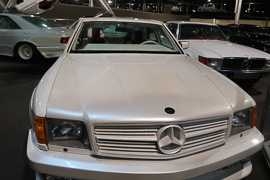 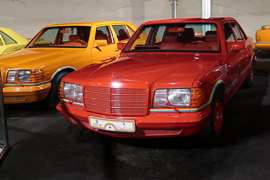 His favorite model of the Germans seems to be the 1983 500 SEL, which is part of the exhibition in numerous colors. 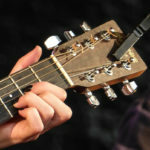 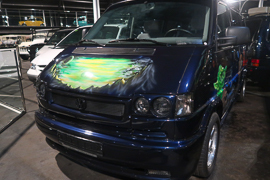 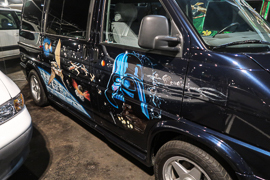 But there are also some other models which have been upgraded with a eye-catching paintwork or decals. 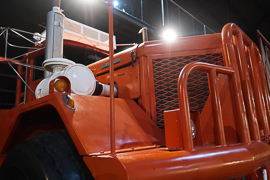 In the rear part of the pyramid, there are a couple of trucks and other utility vehicles. 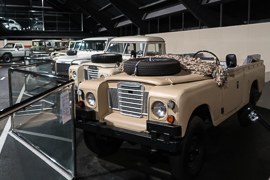 The collector also bought some military cars – none of them is armed, though. 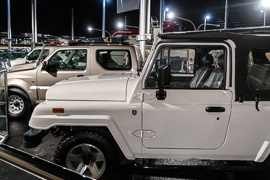 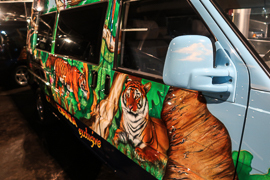 Thereafter, you visit an exhibition of jeeps. 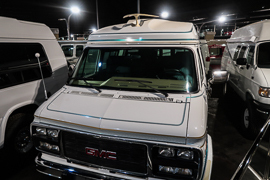 There are even some RVs. 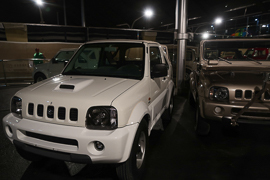 Again, there is huge spread of huge cars and minor ones like the Suzuki Jimny. 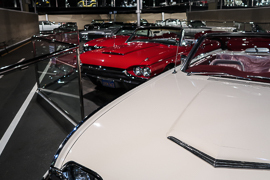 The key exhibit in this section is likely the jeep manifactured by Lamborghini. 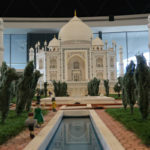 Just when you made it through the main level of the exhibition, you take the way up to galleria level as the last part of the museum visit. 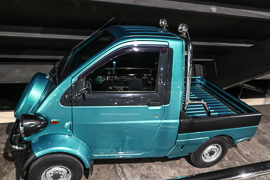 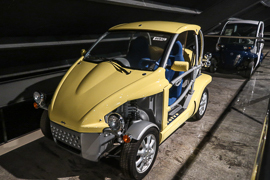 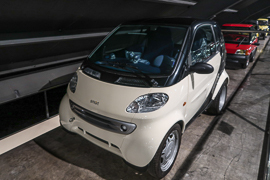 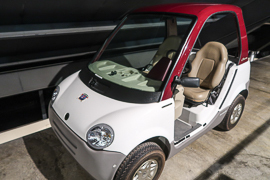 There are no posh cars, no supersize jeeps – but small cars. 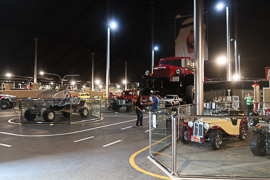 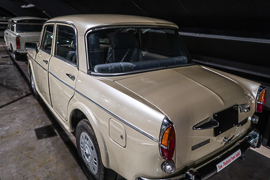 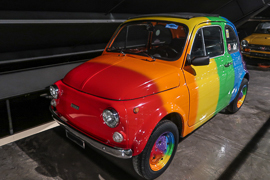 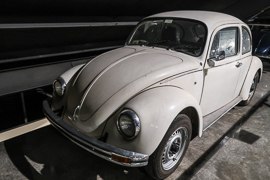 You may see several VW Beetle, a Trabant and some exotics like the Indian Padmini or the Canadian Bombardier Class E.
The Emirates National Auto Museum is just amazing. 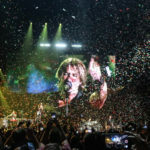 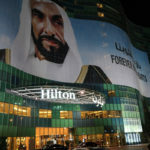 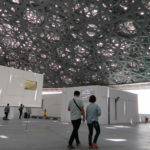 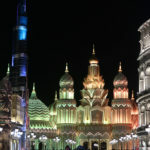 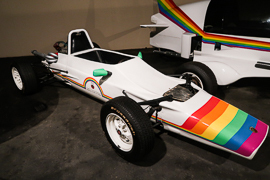 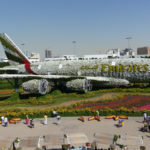 The mega-exhibits give it a touch of the record-state U.A.E. 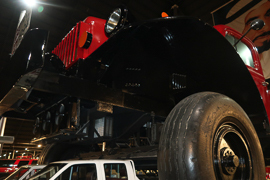 and fits to all the record-breaking buildings and attractions in the country. 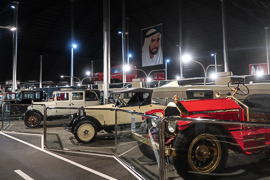 But this museum has soul, you just feel the love for cars of founder Sheikh Hamad Bin Hamdan Al Nahyan. 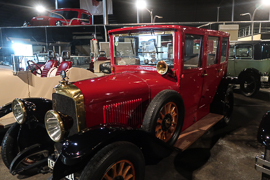 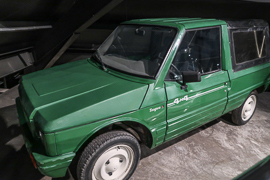 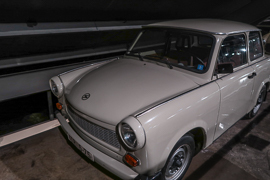 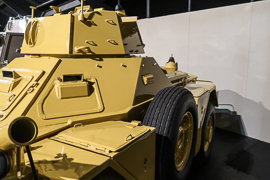 In contrast to the two major German technical museums featuring vehicles, the ones in Sinsheim and Speyer, the “ENAM” offers sorted exhibits and tells you stories. 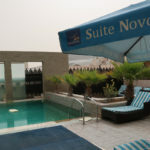 I stayed in and around the pyramid for slightly more than two hours and just had an amazing time. 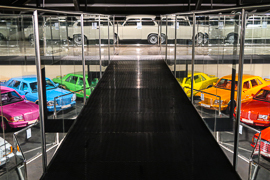 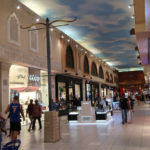 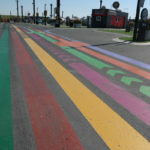 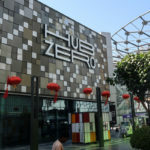 The nice architecture, the wide variety of cars and the huge special models definitely make this place a nice visit for kids (at least for boys…).